2018 is the 10th Anniversary of the Summit which began in 2009 as a one-day-seminar and has grown to truly be a world-class event. We are looking forward to welcoming back Annabel Crabb and Leigh Sales to host, question our guests and make us laugh. In 2018 we will hear from Leigh about her career, the people she’s met (famous and not) and what they’ve taught her about leadership, community and life. We welcome Angela Saini, an award-winning British science journalist (and Engineer) whose most recent book Inferior: How Science Got Women Wrong and the New Research That’s Rewriting the Story sets out to examine the research, from whether little boys really do prefer playing with cars rather than dolls, to whether the structure of the female brain is different from the male, and even whether it was inevitable that humans would end up with a patriarchal society. We will hear from Diane Smith-Gander a highly successful business leader, one of the very few women to chair an ASX200 company and a fabulous advocate for gender equality. 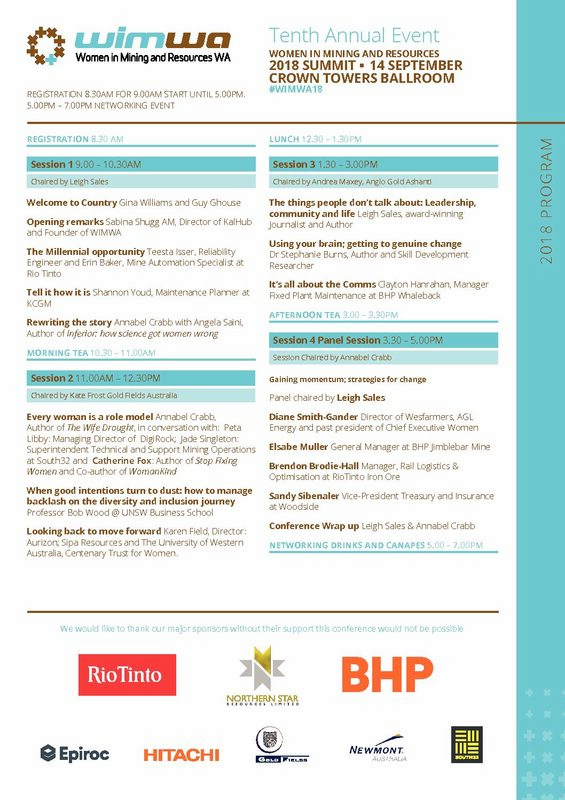 There will be presentations from a diverse group of industry speakers including WIRA’s People’s Choice 2018 – KCGM’s Shannon Youd; this year’s WIRA Outstanding Woman in Resources – DigiRock’s Peta Libby; South32’s Superintendent Technical & Support Boddington- Jade Singleton; Rio Tinto Reliability Engineer -Teesta Isser; PanAust Mining Manager – Kell Monro and Elsabe Muller – General Manager at BHP’s Jimblebar along with other excellent industry speakers still to be confirmed. WIMWA favourite Professor Bob Wood, who over the past few years at our Summit has unpacked the merit myth, highlighted a link between sexism and safety and drawn attention to unconscious bias this year will provide strategies to manage backlash in diverse workplace. We have sold out online please join our waiting list by emailing wimwasummit@womeninmining.com. We are very excited about the 2018 Summit and hope that you will join us in supporting this important event. We have more speakers to announce, but don’t wait to buy your tickets – last year we sold out in the first ten days. 8.30AM to 7 PM - Summit registration commences at 8.30am followed by networking drinks between 5pm and 7pm.